French: Moucherolle phébi; German: Phoebe; Spanish: Mosquero Fibí. 7 in (18 cm). Plumage includes dark brownish gray head and upperparts, dark brownish wings and tail, white underparts (touched with yellow in fall in first-year birds), and olive-tinted sides and breast. Bill is small and black, as are feet and legs. 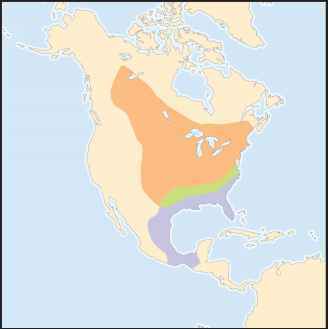 Eastern North America from central Canada to the Midwest and northeastern states; winters in the southern states and eastern Mexico. Lives near lakes and rivers in forest edges, open areas with scattered trees, and rocky areas. Often wags tail on perch. Lives singly or in pairs. Songs include a sharp, repeated "chip!" and a "FEE-be!" with an accent on the first syllable. Perches to watch for insects, catches prey in midair, and returns to perch. Also takes insects from foliage and from the ground. Sometimes takes fruit, berries, and small fish. Breeds two to three times per year. Mostly monogamous, but sometimes a male breeds with more than one female. 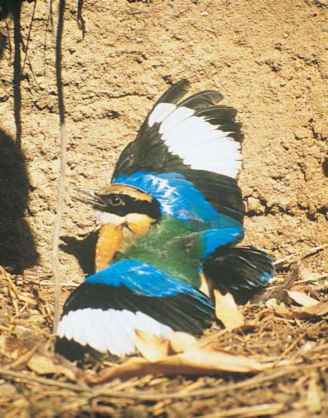 Female builds a cup-shaped nest attached to a vertical wall or on a shelf. Nest may be located on a cliff, building, or bridge. Not threatened by IUCN standards. Blue-listed by the National Audubon Society in 1980 and listed as Special Concern in 1986, due to decreases in several areas across the Midwest, south Atlantic, and Great Lakes regions. Some populations in the 1990s were reported to be stable or increasing, and ranges of some populations were expanding, possibly due to the species' tolerance for human-made structures as nesting sites.